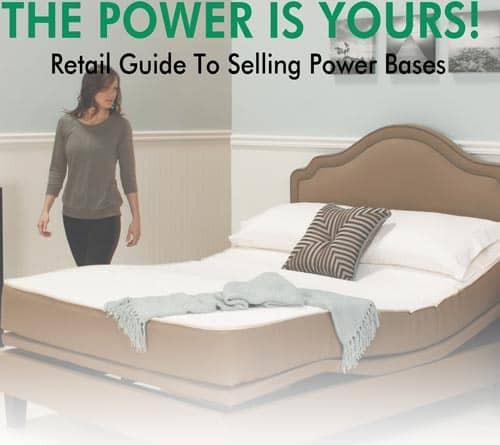 This installment in Furniture World Magazine’s “Selling Better Bedding” series will focus on one of the fastest growing and most profitable bedding sector items, variously referred to as the power base, adjustable base, power foundation or lifestyle base. Five industry experts were interviewed to give Furniture World’s readers insight into how to best promote, display, present, and manage the category. Martin Rawls-Meehan, Managing Member at Reverie, a leading manufacturer of Mattresses, Adjustable Beds and Pillows, provides perspective on the recent growth of the category. “We started selling in the US market in 2004,” he says, “and at that time a lot of retailers were afraid to sell power bases. There were a limited number of suppliers, and it was difficult to get retailers to carry the product with more than one or two floor models. Furniture World asked our experts what they think is driving this trend and, the answer we were told, is profit. Power bases provide a huge benefit for retailers because they don’t take up any additional floor space. Cornelius believes that although the sales volume in power bases is currently a small percentage of total bedding sales, the conditions are right for a huge increase in volume. He also believes that the industry only has a window of 18 months to two years to make this happen. More on what retailers are doing to increase consumer interest comes from Reverie’s Martin Rawls-Meehan. “If you look at what's happening today,” he says, “obviously you see some national advertising campaigns including some of the great things that Tempur-Pedic has done for the category. That's important. Retailers are also running ads featuring reasonable price points that include an adjustable base with a nice mattress -- and that drives consumers into stores. Slumberland has done a really good job of driving in business with ads that feature power bases in their general sale advertising. “A lot of retailers are using promotional price point mattresses on promotional price point adjustable beds to bring in business. I've seen sets promoted at $999 or lower for an entry-level queen with an adjustable base. Retailers are trying to hit the sweet spot for price points and drive traffic into stores. And many lower price point mattresses these days are compatible with adjustable foundations. This brings customers into stores who, in many cases, will purchase a product at a higher price point than is shown in the advertisement. “With that said, however, advertising alone is not going to do it. My sense is that particularly today, the biggest challenge that retailers have in selling adjustable bases is getting retail sales associates to show them every time, or even better, start the sale on an adjustable base every time. In researching this article, Furniture World was told repeatedly that retailers who do a great job of selling power bases have sales associates that do an exemplary job of presenting them at every opportunity. “We think that one of the first keys to doing this,” comments Leggett & Platt’s Jay Thompson, “is to have a number of adjustable bases on the sales floor, commit to the category, and place them in prominent places throughout the showroom. I was in a sleep shop last week and they were all buried in the back. None were articulated, they were displayed flat with no way for customers to tell that the foundations were capable of movement. A selling associate told me, ‘Well, you know, I kind of bring adjustable bases up late and if someone mentions that they might have pain or something, I show it to them.’ Retailers who are getting better results are placing these bases in prominent places in the showroom, under good selling mattresses that are adjustable-friendly. It also helps to display at least a few of them in an articulated position to attract the attention of customers. “Another best practice is to not only have a number of bases on the floor, but also arrange them in a good, better, best lineup. A retailer that shows three bases on the floor, maybe one or two models of each, spread throughout the showroom and displayed nicely with some of them articulated will have an easier time of working them into a selling sequence. Ergomotion’s Johnny Griggs suggests that retailers use the flat bed display approach, and that mattresses be paired with an appropriate base. “We always recommend that the retailer just put their lifestyle bases in the flat position because 99 per cent of customers that come in a store are looking for a mattress only. Adjustable bases are still thought of as a health/ older person’s product. And, even though this perception is changing, when a retailer displays a mattress in an articulated or upright position, what happens a lot of the times is that younger couples, vibrant couples and people who don’t have a health need, won't even look at that mattress. It can send a subconscious message that this is more of a health issue product than an actual lifestyle bed. So, in today's market, it is always better to just lay it flat and then you have the element of surprise once the customer has chosen a mattress. Then you can say, ‘let me show you how you can enhance your new mattress choice,’ and start the demonstration putting customers in positions that fit their lifestyles. “With respect to display,” adds Reverie’s Martin Rawls-Meehan, who also suggests flooring as many adjustable bases as there are adjustable-friendly mattresses displayed, “retailers that embrace this practice have seen an amazing correlation between increasing the number of floor models and per floor model sales. Art Van has embraced this idea, and is seeing extraordinary success. There was some disagreement among our experts as to whether it is best for sales associates to introduce the subject of a power base early in their presentations. Jay Thompson at Leggett & Platt observes that, “Introducing the product earlier, is one of the things that some of the bedding brands that have a lot of success suggest. They show their products as part of a system, working them into their selling sequence, and letting consumers experience them sooner, rather than later. Bringing it up early helps customers start to think, ‘Maybe this is something I would like to consider,’ or if they're not interested, they can shut it down. Bringing it up later in the process as an accessory -- well let's face it -- a power base is a very expensive add-on. Our recommendation is for sales associates to use the presentation style they are comfortable with to sell mattresses, but to be creative and work the adjustable base into the process sooner rather than later. “By the time consumers have decided that they're going to buy a mattress; it feels to them like the sales associate is trying to add something on to the sale. And that's really what they are trying to do when they say, ‘Now that you've chosen this adjustable-friendly mattress, could I interest you in this thing?’ We've learned that attachment rates are reduced the later adjustable bases are brought up in the process. When it becomes a more integrated part of the experience of buying a new mattress, the likelihood of success is higher. Hickory Springs’ Niles Cornelius tells Furniture World that there is a way to “bring it up at the beginning. With this scenario, the sales associate can go through his or her usual welcoming ritual, and then say, ‘By the way, have you seen the advertisement for the advanced Ergo power base that goes up and down?’ And, if they reply, ‘Yeah, I saw that on TV.’ The salesperson can respond by saying, ‘We just got a new base on our floor that I would like to show you. Do you have a second?’ That’s a merchandise greeting used to introduce the power base product early in the sales process. But unless the customer gives buying signals, it isn’t a good idea to dwell on the power base. Instead get them focused on the more immediate goal of choosing a mattress. “99.9 per cent of customers who walk into a bedding department say, ‘I'm looking for new mattress,’ not, ‘I want one of those mattresses that move.’ Once they find the right mattress, it’s time for sales associates to use those great questions they asked previously to help them introduce the lifestyle base to enhance the choice that they've already made. We’ve established that in order to effectively sell power bases you need to show them in a substantial way, and focus customers’ attention on the category. The next step is giving a formal presentation. First and foremost, customers must be encouraged to lie down on the mattress and made to feel comfortable. A number of techniques for doing this were presented in “Dreaming of Better Bedding Sales – Part Three”, posted to the article archive on the furninfo.com website. “When a presentation that's ideal for an adjustable bed is given,” Reverie’s Martin Rawls-Meehan explains, “we see attach rates in many cases that are 50 per cent or higher. But when it's not shown, obviously, people can’t buy it, or if it's not shown right, or not shown with confidence, it's not going to sell. “People have different perspectives, but in our opinion you really want to get customers to feel the benefits adjustable bases provide during the presentation. An extraordinarily powerful technique is to get the customer into the zero gravity position by elevating the head a little, then elevate the feet slightly above heart level. This takes pressure off of the lower lumbar curve, distributing it throughout the body, and giving the customer a sense of weightlessness. It’s a position that relieves the pressure and tenseness generated by the central nervous system typical of lying in a flat-back position on many mattresses. We find that when customers are moved from the flat position to zero gravity, experience our massage system and are told about the system’s features and benefits -- when they are lowered back to a flat position with the massage turned off, they sense immediately that going flat is no longer as comfortable as they initially thought. Leggett & Platt’s Jay Thompson couldn’t agree more. He says that, “Showing them how much more their mattress can be than just a flat surface, is key to closing the sale. Getting them on the bed and getting them to experience the range of positions, is absolutely essential to closing. Research suggests that the in-store presentation sequence is a key driver to closing the sale. Most people don't want to buy these things unless they've experienced them. If they see it in a magazine or a newspaper, they may say, ‘That's interesting.’ But if you don't get them to lie down and have an experience, they are much less likely to buy. Ergomotion’s Johnny Griggs provides additional suggestions on how to perform an expert presentation. “I always raise the lower body slightly before I do anything,” he explains. “It's a feeling that everybody can recognize because when you raise the lower body first, it relieves stress off of the lower back. Then once the customer says, ‘That's high enough, that feels really good,’ I move the upper body into whatever position is appropriate for their lifestyle. If I found out earlier that they have a TV in their bedroom, and the customer told me that they wake up early in the morning and watch the news, then I might ask them, ‘By the way, how do you watch TV? You usually stack the pillows, right?’ And, if they reply, ‘yeah.’ Then I say, ‘Let me ask you how would this be?’ And then I raise the upper body. It is always a good idea to start with a lower body massage feature first as well. Then introduce the upper body massage. Our retail experts all agree that the most important contributing element to a successful close is a proper beginning. When retail conditions include great display, a willing customer, and a knowledgeable, motivated sales associate; closing can just happen naturally. Often times, however, customers can have objections and price concerns that can benefit from an additional sales technique. “Either the selling process starts with signage, or with the beds displayed in different positions, showing that they are resting on power bases,” continues Hickory Spring’s Cornelius. “And one of the most successful retailers I've seen, after going through the process of mattress selection, closes by saying, ‘Now, let's talk about the foundation.’ And in most cases, the consumer looks at them quizzically and replies, ‘What do you mean, the foundation doesn't come with it?’ And the salesperson says, ‘Of course it comes with it. But you have options. I'd like you to lie down here, and I'm going to show you my recommendation.’ At this point the salesperson demonstrates the power base. “But let's say that following the demonstration the customer says, ‘So this adjustable foundation changes the price?’ The salesperson replies, ‘The foundation that comes with this bed has a certain amount of cost to it. But if you upgrade to a power base, I can give you credit for the flat foundation that comes with it, and you will only pay the difference.’ At this point, the worst thing that will happen is that the customer will buy the mattress they selected along with the flat foundation. Selling features without benefits: “A major error sales associates make is selling a feature without the benefit that is matched up to the customer’s need.” -Jay Thompson, Leggett & Platt. Making assumptions about your customer: “Another mistake is assuming that your customer cannot afford an adjustable base, or for some other reason is not a candidate. That’s too bad, because there are a lot of opportunities to get surprised when retailers actually take the time to put customers through the selling sequence and try to understand what their needs are. If you show them how the product can improve their lifestyle and their comfort level, a lot of people say, ‘You know what, I want to invest in this, I'm investing in my comfort and well-being.’ Judging them early definitely decreases the attachment rate. There are probably going to be low conversion rates in some parts of the market. But there is a much broader market for adjustable bases than the 45 or 50 year old man or woman who has a nice watch and is looking at Visco foam mattresses. There's a much broader audience that can afford it and is willing to pay. Jay Thompson, Leggett & Platt. It won’t fit with my frame: “Many problems arise because sales associates are not sufficiently prepared to professionally present power bases. So, for example, a customer might say, ‘My grandmother passed down a headboard that was hand carved in 1812. Will this work with it?’ And if the sales associate isn't properly educated, they might not know that any situation can be accommodated during delivery. So even though this is a question, not an objection, if the customer doesn't feel that he or she received a knowledgeable response, they will probably say, ‘You know, I'm just going to go with the wood foundation. I know that will work.’” -Niles Cornelius, Hickory Springs. Neglecting customers’ health concerns: Most of this article has stressed the new found attractiveness of power bases as a lifestyle choice. Your customers’ car seats recline, tilt and heat up for a bit of added comfort. Likewise, new iterations of power bases allow for more comfortable positions for sleeping, reading, interacting with family, television watching and massage -- all in a fashion forward, technically attractive package. The more traditional market for adjustable bases is still present and growing. “A huge percentage of our population are baby boomers who are starting to enter in to that age group where some of them need a little more than just a regular bed,” instructs Flex-A-Bed’s Ben Groce. “They are buying for health concerns. There’s a huge customer base. It’s a shame that so much of the marketing now is exclusively aimed at younger customers, because there is a big market among baby boomers and their parents. For people of all ages who have acid reflux, hiatal hernias, bad backs, poor leg circulation, restless leg syndrome and other chronic conditions, there are health benefits adjustable beds provide. “Furniture retailers are losing business to home health care stores and Internet specialists. I wouldn’t suggest that most furniture stores feature photos of older, disabled people in their regular advertising, but for most furniture and bedding retailers, it’s not best to ignore the health benefits either. “Of course, it’s important to be careful about the message given in advertising and sales presentations. “Sales associates shouldn’t say that if a customer buys an adjustable bed, it’s going to cure all of his or her problems. What we always tell them is that the product will help to alleviate some of the symptoms. “An adjustable bed can be a transitional product for some customers, Groce continues. “A flat bed is not quite good enough for them or their parents, but they are not to the point yet where they need a hospital bed. That’s why a lot of our retail dealers display a hi-low that looks similar to the other adjustable beds on their floors. It has the massage, raises the head and foot, but for people that have a need, showing the bed in motion helps them to understand the benefits. It may be that most customers won’t have any interest, but for those that do, there’s a lot of margin to be had. “Furniture retailers who make a commitment to this segment of the market have had success networking in their communities to get referrals from local physicians, social workers, chiropractors and other health professionals. The first thing though is to educate salespeople to be able to intelligently assist customers who have health concerns.”-Ben Groce, Flex-A- Bed. Weight and delivery objections: “There are sometimes objections about weight. Customers may say, ‘I bet that thing is heavy. I'm on the third floor, and my house was built in 1610,’ or ‘I live on the fourth floor of a row house in Philadelphia and I don’t think that you can get this up there.’ If the retail sales associate isn't that savvy, and doesn’t realized that there are queen split power bases, and that the mattress is bendable, many sales associates will find it easier to just let the sale convert to a regular foundation and lose an opportunity to improve the customer’s life.” -Niles Cornelius, Hickory Springs. Making assumptions about the features customers will like: “It is a big mistake to assume that customers are going to like every feature of a base. For example, a lot of times the sales associate will turn on the massage motor and the customer will say, ‘Wow, I don't know whether I like that.’ And instead of saying, ‘Oh, let's turn it off now, but maybe you might like it for those really stressful days,’ Some sales people will respond, ‘you'll love it after you lay there for a while.’ But that's just sales 101; the importance of listening to your customers.” -Johnny Griggs, Ergomotion. Fear of adding to the sale: “Many salespeople, after they sell a mattress, are afraid of trying to boost the sale another couple of grand. That’s one of the biggest mistakes of all.” -Niles Cornelius, Hickory Springs. There was also consensus among our experts that management oversight, proper reporting and continuous sales education can overcome low attachment rates. Flex-A-Bed’s Ben Groce, says that, “The main thing is that store management has to make a commitment. If you want to sell adjustables, you must learn a lot about them. The best dealers are the ones whose salespeople are the most knowledgeable about the product. But there are still times when I am in retail stores and see customers asking questions that salespeople just can't answer. They don’t know the specific features or benefits, and that creates doubt in customers’ minds about the product. I can just see customers thinking, ‘If the salesperson doesn’t know enough about this product to sell it, it must not be worth buying.’ People can tell when salespeople are genuine and excited about a product. Cornelius explains that when he gives presentations to groups of salespeople, he removes the mattress, turns the base upside down to show quality construction and ease of maintenance. He then speaks about service and what customers should be instructed to do if they have any difficulties. “Sometimes,” he says, “I see some of them dozing, and usually it's the top salesperson. But if there are a dozen people attending the session, there will be one or more that will immediately become passionate about my product. When that happens, it's like osmosis, and the passion will eventually transfer to everybody. Enthusiasm breeds enthusiasm. So I quickly figure who is going to be the passionate player, then I'll focus on that person to help train the rest of the retail sales force. Martin Rawls-Meehan at Reverie feels that reports are essential. “Reports are important,” he says, “because in any retail organization there are a variety of different performance levels with respect to attach rates for adjustable beds. Some stores can be at 50 per cent while others will be at single digits. What good reporting does is provide detail on what practices are working to produce good results. They give managers a reason to go out and talk to those people who are doing things well, and those who are having trouble, to figure out how to resolve performance issues to bring everybody up to those high numbers. There’s one last aspect of training that retailers neglect at their peril, Hickory Springs’ Niles Cornelius tells Furniture World. It’s making sure that delivery people know how to deliver and set up adjustable bases properly, plus answer customer questions about how to operate them.